Market access is about ensuring that the right patients have access to the right treatments at a fair price. 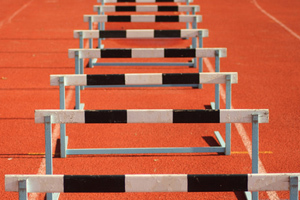 Achieving market access in today's healthcare environment has its challenges. A recent survey of the UK pharmaceutical industry explored companies' perspectives on these challenges and how they planned to meet them. Across Europe, the framework for the pricing and reimbursement of pharmaceuticals has become more complex. Cost-effectiveness has become a key consideration alongside safety, quality and efficacy. The changing nature of healthcare policy has a key role to play too, as has innovation in the funding, commissioning and delivery of healthcare services. Marketing consultancy PharmaBase was commissioned by Plexus – a joint initiative from AXON and Decideum – to survey 27 pharmaceutical companies, including five of Europe's top ten firms. The responses showed that developing an effective market access strategy requires a co-ordinated approach, with no 'one size fits all' solution. This is, perhaps, particularly the case in a market like the UK, where access is fragmented as decision-making is increasingly devolved to the local level. Indeed, local decision-making was highlighted as being the greatest challenge currently facing the uptake of medicines in the UK. 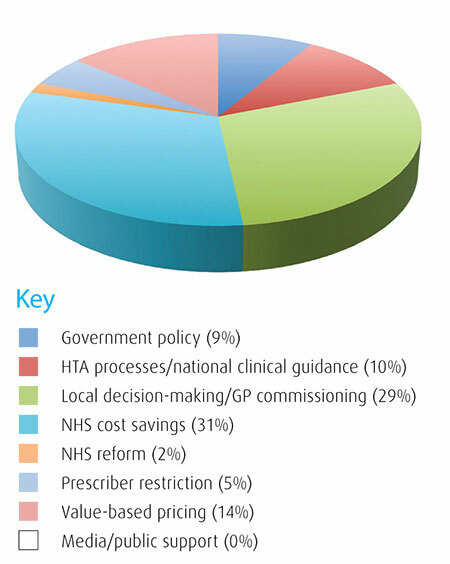 Alongside this, companies identified the present drive for cost savings in the NHS as the other key barrier. The picture for the medium- to long-term market appeared less clear. Reaction to the government's proposals to reform the framework for the pricing and reimbursement of medicines through the introduction of value-based pricing (VBP) was uncertain. Survey respondents seemed equally concerned about how a VBP system would appraise medicines, how relevant weightings such as innovation, unmet need and disease severity would be agreed and the overall negotiation process around pricing. Perhaps because of this uncertainty, most respondents did not indicate strong concerns over the impact on market access of any plans to remove the responsibility for the appraisal of medicines (for use by the NHS) in England and Wales from the National Institute for Health and Clinical Excellence (NICE). It remains to be seen how views may change as the government's agenda becomes clearer. The survey identified the three most important elements of a successful market access plan as pricing, health outcomes/health technology assessments (HTA) and milestone management. While it is understandable that these three elements were prioritised, it was recognised that other components such as stakeholder mapping, issues preparedness and professional/patient advocacy were relevant to the development of a winning strategy. Indeed, preparing for market access involves understanding the needs of the whole healthcare environment, including both clinical and non-clinical stakeholders. Success can hinge upon how well companies understand and plan for the impact that these stakeholders may have at each stage in a product's life cycle. It is this complexity that requires market access specialists to operate across a range of fields from health economics to internal planning and external communications. Each product brings with it a different mix of issues and responding to them involves a blend of competencies tailored to the specific challenges they present. As such, despite respondents acknowledging the importance of market access planning, the results of the survey suggested a lack of clarity around what market access actually meant and how, therefore, to plan and implement a successful strategy. The survey additionally sought to explore how companies engaged with third-party consultants and agencies to support their market access needs. Over half of the respondents said they would look to engage these organisations at pre-regulatory approval stage, with health outcomes/HTA support and public/government relations overwhelmingly topping the list of services sought. Interestingly, over 40 per cent of respondents claimed to prefer working on a project with a single, specialist market access agency that offered a range of services rather than with multiple agencies. The reasons given included them being more likely to see projects completed on time, a more cost-effective use of resources and because their roles were simply too busy to allow them to juggle multiple agencies. From the results, it is clear there is no, single 'off the shelf' solution to developing and implementing a successful market access strategy that works within the UK and beyond. While current pressure on the NHS to make cost savings and proposals to increase the localisation of commissioning present obvious challenges, the impact of medium- to long-term plans around the future of HTA, pricing and reimbursement are, as yet, unclear. One thing that is understood, however, is that all companies believe they need to plan thoroughly to ensure that they have health outcomes data to support HTAs. Overall, there appeared to be a lack of consistency in defining market access, its challenges and therefore how to approach it. As such, responses showed that a range of competencies was important in delivering a successful market access strategy. To support companies in meeting these challenges, it appears that many would choose a single, specialist market access agency over multiple agencies or internal resources alone. As market access involves an often complex blend of elements from pricing and HTA through to stakeholder engagement, government relations and PR, engaging the services of a specialist agency that is able to bring together these elements may therefore be viewed as preferable in terms of both time and cost-efficiency. Natalie Henson (left) is an associate director at AXON. Joanne Maehre is a senior account director at Decideum Ltd.